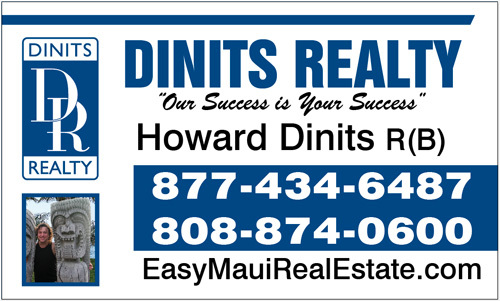 Ever wondered about the Property Taxes in Maui? The first property tax bill of the 2015/2016 fiscal year went out to Maui Property owners last week. That was a good reminder for me that we have yet to publish the property tax rates for this fiscal year on this blog. This post gives prospective property buyers a sense of what type of property taxes they might expect when purchasing a place on Maui. This is another year where we have seen a decrease in rates. Maui County Council has been trying to offset increases in assessed values by decreasing the rates per assessed value. Here are the rates for the next fiscal year as compared to the rates from last year. The Residential rate decreased from $5.57 to $5.40. The Apartment rate decreased from $6.20 to $6.00. The Commercial rate decreased from $6.83 to $6.60. The Industrial rate decreased from $7.07 to $6.85. The Agricultural rate decreased from $5.86 to $5.75. The Conservation rate decreased from $6.06 to $5.90. The Hotel and Resort rate decreased from $9.11 to $8.85. The Time Share rate decreased from $15.07 to $14.55. The Homeowner rate decreased from $2.78 to $2.75. The Commercialized Residential rate decreased from $4.46 to $4.35. All of the rates above are per $1,000 of assessed value. Homeowners are also eligible for a $200,000 exemption which may be deducted from their assessed value. For example, someone who qualifies for the homeowner classification that has a property assessed for $700,000 would have $200,000 deducted from their assessment for a net taxable value of $500,000. Applications for homeowner exemptions should be submitted to the county by December 31st. Check with the county for the latest and most up to date eligibility guidelines. The minimum property tax rate bill for Maui County is $150. Taxes are paid in two installments with bills sent in August and February. The county has an online resource available entitled Understanding Property Taxes which goes into more details on assessments, how properties are classified and timelines.